The ICE HKA has recently introduced two new initiatives to promote knowledge exchange. They are Technical Report Prize and ICE HKA sponsorship for attending international or regional conferences. Our Hong Kong branch organises and supports awards which showcase the outstanding achievements of ICE members. This Prize is awarded to members who prepare reports of a high standard on a designated technical meeting, conference/seminar, breakfast forum, or site visit organised by the ICE HKA. Student and graduate members as well as other members who attained their professional status within five years before the event are eligible to enter. Winners will be given a prize of HK$500, or granted free attendance at the ICE HKA Annual Conference or Annual Dinner. For more information, please refer to the Technical Report Prize Rules. The establishment of the ICE HKA sponsorship for members who attend international or regional conferences on topics within the realm of civil engineering. The purpose of the sponsorship is to encourage Hong Kong-based ICE members to participate in these events in order to broaden their knowledge and learn from experience in local or overseas projects. Student and graduate members as well as other members who attained their professional status within five years before the event are eligible to apply. Successful applicants will be awarded up to 100% of the cost of conference attendance, excluding travel and accommodation expenses. Please refer to the Information Pack for more details. Download the ICE HKA Conference Sponsorship application form. 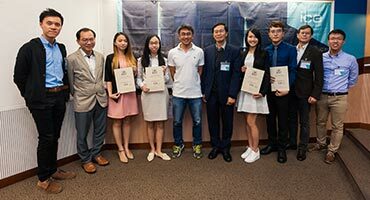 The Hong Kong Association Graduates and Students Emerging Engineers Award promotes and awards excellence in communication of civil engineering ideas, research and best practice on projects and design. Applicants compete for prizes in the Hong Kong regional final and winner may be shortlisted for the Emerging Engineers global final in the UK for a cash prize and medal. The competition is open to all graduate and student members of ICE resident in Hong Kong. Author must be a current graduate or student member of the Institution of Civil Engineers at the time of entering the Award. Papers are to be written by one author only. Papers must follow the Rules of Paper Submission. Authors are permitted to enter Emerging Engineers Award in consecutive years but not with the same paper. Shortlisted candidates will be allocated a total time of 20 minutes; 10 minutes for presentation and 10 minutes for discussion. The presentation will emphasise the key features and approaches to your topic. The Emerging Engineers Award culminates in a national competition. 3 winners from across the UK are selected to take part in the final, held at our headquarters in London. The selected finalists each present their papers, with the overall winner receiving a cash prize and the prestigious Institution Medal. Communications Competition has been hosted in the UK as one of the signature events for young ICE members for years. It aims at nurturing the young members by developing their skills and techniques for public consultation and preparing them to excel in this increasingly demanding society. The competition consists of written tasks and a 30-minute interactive mock public consultation meeting where competitors present a development project and face questions from judges and audience. In addition to the presentation, the teams have to prepare the following documents to support delivery of the mock public consultation meeting. The project scenario will be released once the application is closed. You can find out more in the Information Pack. You may register here online for student membership for free and graduate membership. Application to the competition is valid as long as the membership registration is submitted on or before 30 November 2018. Should you have any enquiry on membership, please feel free to contact Regional support team on +852 3153 4185 or at [email protected] for assistance. In case of overwhelming response, shortlisting mechanism will be introduced and notified to successful applicants. Please feel free to contact Ms Irene Ngai on +852 5507 2225 or via email at [email protected] for any enquiry. ICE HKA G&S reserves all rights of the competition except the result of judgement. Model Building Competition is an annual competition in which participating teams formed by civil engineering undergraduates will compete against each other. The event can arouse the interest of undergraduate students in engineering and provide them with a valuable chance to apply their technical knowledge and creativity into practical use. This competition also requires students to present their engineering justification of the model built where they would further polish their presentation skills. Participants are required to build a model made of Balsa wood within a given time limit. The model will be tested by applying loads on the building fixing on an earthquake simulating machine. The theme of this year is “Introducing and Demonstrating Earthquake Engineering Research (IDEERS)”. A refundable deposit of HK$100 per team will be collected during registration. This deposit will be refundable if the team is not enrolled in the competition. The project specifications, rules and judging criteria will be made available after the event registration. The competition consists of three parts: model building, testing and presentation. Model building: Teams are given 210 minutes to complete the model according to specifications of the competition by using materials and tools provided by ICE only. Penalty is applicable if overtime working happens. Testing: The model will be tested based on the project specifications. The assessment of the structural performance includes both physical measurements (i.e. dimensions, self-weight) and structural integrity/efficiency (i.e. loading performance). All tests will be performed by ICE under the witness of honourable judges. Presentation: Each team is given 5 minutes to illustrate their engineering justification regarding the model in English only. Penalty is applicable if the presentation is over 5 minutes. Prize and certificates for winner, first runner-up, second runner-up and best presentation teams will be presented in G&S Annual General Meeting. *You may register online for student membership for free. Application for the competition is valid as long as the membership registration is submitted on or before 6 January 2019. Should you have any enquiry on membership, please feel free to contact the regional support team on +852 3153 4185 or at [email protected] for assistance. ICE HKA G&S reserves all rights of the competition except the result of judgement. This is a first-of-its-kind civil engineering themed board game. Participants can join the competition either individually or in a team of not more than eight persons. The activity comprises four stages, namely a Briefing Session (Mar 2017), first round competition (2 Sept 2017), final round competition (Nov/Dec 2017) and presentation/demonstration of the winning board game at Launching of ICE 200 Activity Series (Jun 2018). Simulating the Civil Engineering World and Earn a Prize! To tie in with "ICE 200: Civil Engineers Transform Your Life", ICE HKA is organising a Board Game Design Competition for civil engineering students, secondary school students and the general public. Entry teams will design a board game which simulates the civil engineering world in an exciting and informative way. Winning board games will be produced as a souvenir, or publicity/outreach merchandise, or a charity product for ICE 200. Sharing by a "Board game expert"
Videos of the briefing session have been uploaded to our facebook page. Participants must submit their applications and entries by 31 July 2017 to ICE Hong Kong, Room 1606, 16/F Dominion Centre, 43-59 Queen's Road East, Wanchai, Hong Kong. The first round of competition will be held 2 September 2017. Participants are required to give a 15-minute presentation on the design of their entries. Each team selected to be a finalist will receive HK$2,000 cash prize, which may be used to produce game prototype and rulebook for the final round of competition. The final round of competition will be held in November/December 2017 (TBC) in the form of game demonstration. Participants are required to prepare game prototypes and rulebooks for introducing their games to and teaching the judges to play. The game demonstration by each team should not exceed 45 minutes, including presentation of game design and rules. The champion will receive a cash prize of HK$20,000. The 1st runner-up will receive a cash prize of HK$10,000. The 2nd runner-up will receive a cash prize of HK$5,000. The winning games may become a souvenir for ICE bicentennial celebration. The Institution of Civil Engineers Hong Kong Association (ICE HKA) Photography Competition is open to all ICE members and the general public. It aims to raise the profile of the profession and help the public understand what civil engineering involves and the positive impact it has on the society. Photograph submitted must be original and has not been used elsewhere. The content must be related to civil engineering projects in Hong Kong, either on-going or completed within the last 10 years. Minimum size of the photograph is 3MB in JPEG format. If you are taking photographs on a construction site, please stay safe and follow the site guidance. Photographs taken using drones are acceptable but must follow legal requirements. Photographs taken through illegal use of drone (eg within airport area), unauthorized entry, or in any unsafe condition will be disqualified. Submit your photograph via email to [email protected], with subject “ICE HKA Photo Competition 2019”, together with a title and a paragraph with maximum 100 words to describe your submission. Please contact Alan Cheng by phone on +852-96408222 or email: [email protected], for any enquiry. Each entrant may submit as many as 10 entries but no entrant may win more than one prize. No responsibility can be accepted for entries lost or delayed in transmission whether on Facebook, by email or otherwise. ICE HKA takes no responsibility for damage or loss resulting from misdirected or incomplete entries arising from computer errors, viruses, bugs or other causes outside its control. By entering this competition each entrant confirms that his/her entry could be released to the public and in compliance with the terms and policies of Facebook and the law. Photographs may be enhanced to make them brighter, clearer etc., but the content must not be manipulated. ICE HKA and the judging panel reserve the right to verify the eligibility of submissions and to exclude any image they believe has been excessively treated altering its authenticity. The decision made by the judging panel shall be final and no appeal will be accepted. Entrants may submit or be required by ICE HKA to provide the original or a higher resolution version of entry. Such version(s) shall be considered as the same entry and bound by these terms and conditions. Top three prizes will be awarded at the ICE Annual Dinner on 21 June 2019. If the winners are unable to attend, they must claim their prize within 30 days after the Annual Dinner. If the prize is unclaimed after this time, it will lapse and ICE HKA reserves the right to offer the unclaimed prize to a substitute winner selected in accordance with these rules. By entering this competition each entrant confirms that his/her entries are their wholly-owned creation and are no longer protected by copyright or other intellectual property rights. The entry must not have been published previously in/on any other publication or website. Entrants must own the copyright and will retain copyright; however in entering the competition entrants are agreeing to ICE retaining the entries and using them for future publicity, illustrative and other non-commercial purposes. No fees will be payable if the entries are used in this way. Entrants will keep ICE harmless from any claims in relation to their entry in the event that the entry infringes the personal or proprietary right of any other person. Each entrant also confirms that any persons depicted in an entry have given permission for the inclusion in the entry and the use of the entry including their image by the entrant and ICE. By entering this competition, all entrants consent to the use of their personal data by ICE for the administration of this competition and other marketing purposes for ICE. ICE HKA reserves the right to add, cancel or amend the terms of this competition at any time without prior notice. In the event of any dispute regarding the rules, conduct or the results of this competition, ICE HKA’s decision will be final. ICE HKA reserves the right to disqualify any entrant if it has reasonable grounds to believe that the entrant has breached any of these terms and conditions. By entering the competition each entrant agrees to be bound by these terms and conditions and the rules of this competition. Looking to further your civil engineering career or want to get your career off the ground? Want to help solve issues around the world from connecting a remote village to solving the energy shortage? Then a career in civil engineering could be just for you. Find out what you will need to know to start your career or further your development in civil engineering, no matter what stage you're at. Find out about the latest civil engineering project changing peoples lives.